That Glen Eira is already the third most densely populated municipality in the state – only behind Melbourne and Port Phillip – both of which are special cases anyway. No realistic estimates of what Wynne’s new legislation will mean for accelerated development in both Neighbourhood Residential Zones and the General Residential zones. The housing paper we believe fails to adequately account for these changes and their potential for much more development. No consultation with residents as to whether or not they are accepting that various activity centres should be able to have a dwelling ratio of over 200 dwellings per hectare! A hectare is 10,000 square metres. If we assume that the average housing block is 500 square metres, this means that 20 houses will be replaced by over 200 in countless residential streets. Carnegie – Assumed 36% of developable land in the centre for future residential development of at least 200 dwellings per hectare. Caulfield Junction (inc. Caulfield Village) – …. it is assumed that 36% of developable land in the centre for future residential development of at least 200 dwellings per hectare. Elsternwick – development. Assumed 36% of developable land in the centre for future residential development of at least 150 dwellings per hectare. Bentleigh – Assumed 28% of developable land in the centre for future residential development of at least 150 dwellings per hectare. Caulfield South – Assumed 28% of developable land in and around the centre for future residential development of at least 100 dwellings per hectare. 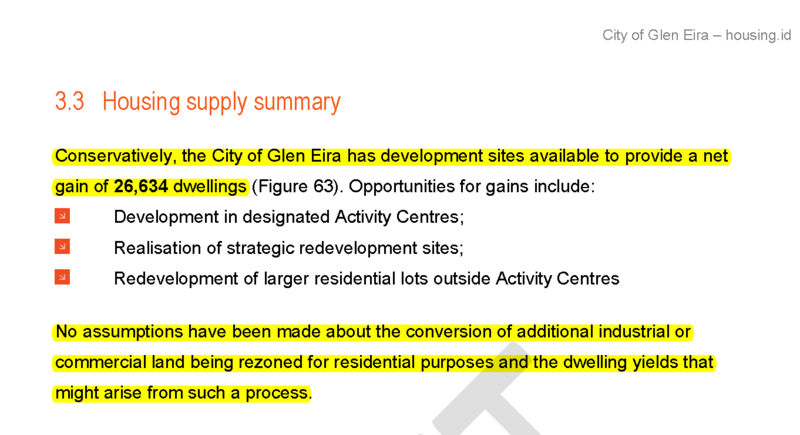 Glen Huntly – Assumed 28% of developable land in and around the centre for future residential development of at least 100 dwellings per hectare. Caulfield Park – Assumed 28% of developable land in and around the centre for future residential development of at least 100 dwellings per hectare. Hughesdale – Assumed 24% of developable land in and around the centre for future residential development of at least 100 dwellings per hectare. McKinnon – Assumed 24% of developable land in and around the centre for future residential development of at least 100 dwellings per hectare. Ormond – Assumed 24% of developable land in and around the centre for future residential development of at least 100 dwellings per hectare. Ripponlea – Assumed 20% of developable land in and around the centre for future residential development of at least 75 dwellings per hectare. Gardenvale – Assumed 20% of developable land in and around the centre for future residential development of at least 75 dwellings per hectare. Alma Village – Assumed 20% of developable land in and around the centre for future residential development of at least 75 dwellings per hectare. Patterson – Assumed 20% of developable land in and around the centre for future residential development of at least 75 dwellings per hectare. East Bentleigh – Assumed 16% of developable land in and around the centre for future residential development of at least 75 dwellings per hectare. We urge all residents to read the Housing commissioned paper and to digest its message. (UPLOADED HERE). Query the assumptions! Query the figures and finally query the (secret) agenda! We will be doing this in future posts. If this is the case it is the most disgraceful sell outs of residents ever. Makes an absolute mockery of the role of Council in making decisions in the best interest of all residents. We have been treated in a contemptuous way ever since the Planning Scheme Review Process and this is a further continuation. So this was the agenda all along, don’t listen to anything and just develop the crap out of the place. Perhaps one of the most significant plans that Council will develop and no community information session or scope for general discussion. Development sites available are 26,634. The Council line to deliver 9,000 new dwellings by 2031 is nothing more than an absolute fabrication. The last three years have seen an average number of new developments of 1,600 per annum so effectively new developments need to be slowed down. How can the GE staff be so polluted by the political process. They should provide a response to this report and if not hold their heads in absolute shame. The level of collusion between the local and state government at the expense of the rate payer absolutely stinks. To add salt to the wound, my rates contributed to the payment for the staff and the report. I’m furious. I see that Council is seeking feedback on the Council Plan at the moment. It includes five key themes: Liveable and Well Designed, Accessible and Well Connected, Safe Healthy and Inclusive, Clean and Sustainable, Informed and Engaged. My feedback is rip it up as it is already out of date, the goal posts have already shifted to the following themes: Treat Them Like Crap, Don’t Care Less, Look After Our Own Futures and Get Into Bed with State Government. That would be a more honest Council Plan, but then why would honesty be expected. Value capture, repurposing speak English, stop waisting everyones time with this rubbish about “We Care”, you don’t give a SH*T.
Agreed. Furthermore the 26000 doesn’t include more and more rezoning like the McKinnon road amendment nor the thousands that will land at the Virginia village. If the activity centre borders grow then we will have more rgz and more grz. Add on another 5000 or so. Bent, Elliott and others will end up looking like low density. As for the building design that’s another furphy and will not stop developments. All done by design and as you say Absolutely Disgraceful, done deals that stink to high heaven. Council defined study areas, generally representing an 800 metre distance from the edge of the commercial-zoned areas. Activity centres from the edge. That expands the area. Before circles were drawn from the centres of the commercial and near railway stations. Not any more. This is growth and more growth. Unfortunately the corporate edifice see’s all this development as a weird competition, to see who can attract as much development into their sphere of empire as possible. Out doing their neighbouring municipalities is all part of their silly money making game. It’s basically a race to the bottom, and not a graceful rise to sustainable living. Important factors like the sustainability of clean air, clean water, enough tree canopy cover to ameliorate the effects of climate change (the heat island effect), enough open space to meet the multiplicity of residents needs (not just sport), adequate drainage and soil permeability levels to help stop flash flooding, the list is long. These other needs are not inferior and have been identified and acknowledged in reports and strategies in Glen Eira recent past. However this information has been conveniently forgotten when it come to the planning staff. We cannot just add sustainable development to our current list of things to do but must learn to integrate the concepts into what we do. A sustainable future is one in which a healthy environment, economic prosperity and social justice are pursued simultaneously to ensure the well-being and quality of life of present and future generations. A one sided economic view on planning is not sustainable, the auditor generals report stated this clearly. “All planning decisions must comply with the objectives of the Act and the planning framework. To achieve this, the planning system requires the assessments that inform decisions to integrate all relevant policies and planning matters. Assessments must also balance conflicting policy objectives in favour of net community benefit and sustainable development for the benefit of present and future generations. Analysis must be transparent, based on evidence and address all relevant planning matters.” Auditor Generals report 2017. The undercurrent idea we are sold by Glen Eira’s bureaucrats is we’ll have a larger rate base to cover costs of renewing infrastructure of all types, roads, parks, pavilions, libraries, you name it. But, is there evidence to say the more people we bring into our city will actually make running this city less expensive. Maybe it does the opposite, my rapidly increasing rates may suggest this more expensive scenario is the likely one. Our planning needs to be balanced with our other GE strategies, that have identified other concepts and ideas just as important to our present community needs as they will be for future community needs. How much is too much! and is it sustainable in the context of being environmentally and socially and economically sustainable should be the questions being asked and honestly answered by the planning staff. Where there’s life there’s hope, sadly the planners headspace are as dead as the dodo. Yup, growth and profit and rates. That’s all they care about. Did any councillor reveal this was their vision for Glen Eira when seeking election? GECC has failed to manage the loss of amenity for construction activity, has admitted rapid growth is resulting in poor amenity outcomes, but clings to the pretence growth is sustainable. Id report pulls numbers like 100, 150, 200 dwellings per hectare out of its arse. That is NOT the way to deliver on the objectives of planning in Victoria. Report claims: “Neighbourhood Residential Zone, which covers almost 80% of residential zones in the City”. Since that is wrong, I wonder what else is bogus in the report.